MISS NATASHA ENQUIST: ELECTRO-ACCORDION CHANTEUSE: Word to your Mother! To all the Momma's out there! ♥ Happy Mother's Day ♥! 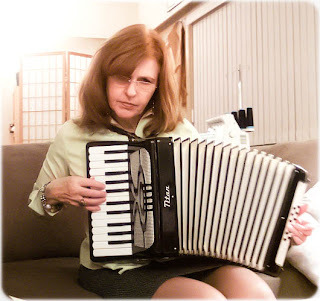 My Mother is the original Accordion Girl, and I have early memories of her playing the accordion in our home. I played piano, and she can as well, but she would also rock out on our organ and accordion. I can remember being handed this baby Titan accordion when I was very little and my parents seeing if I could handle it in my arms. It was a bit overwhelming, and I don't remember it after that, and I stuck with the piano. My Grandmother loved that I played the piano, attended all my nerve-wrecking recitals, and also supported me in what I chose to do with my life. 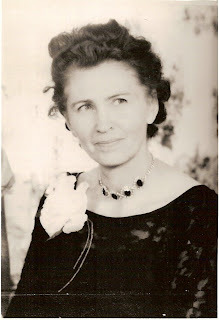 It was the anniversary of my Grandmother's passing just this past April 23th, and it had me wondering what she would think of what I have been up to over these years. 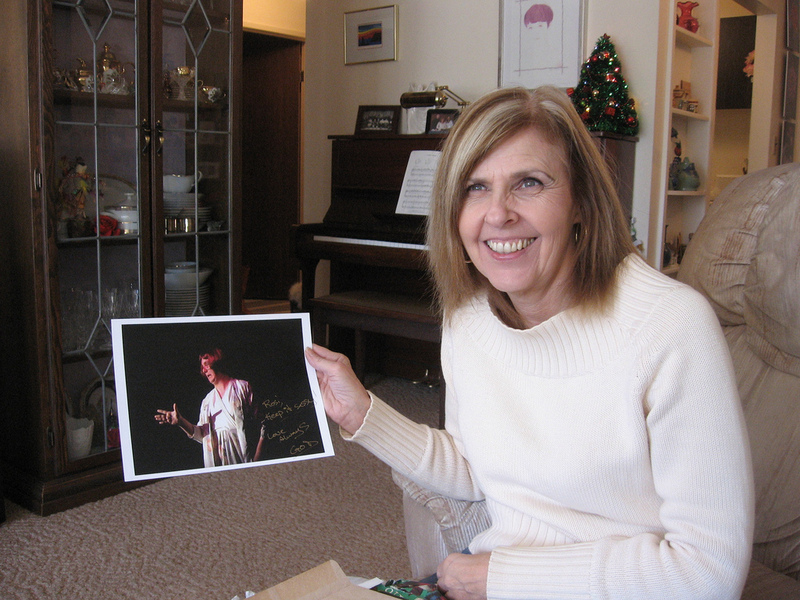 She always loved that I played music, and I know my happiness was important to her and that I was healthy and well. I wondered how she would feel about my lying in the ER from heat exhaustion. She would probably be horrified and since she was a religious -yet made up her own rules- would have let me know she was praying for me. She'd probably also wonder if I work with Mickey, and then tell me a long story about Walt - from the point of view where you'd almost think she knew him. My Mom wanted to learn how to play the piano when she was a little girl, but like many parents in the 50's and 60's they said "YES!" to the Accordion Salesman and purchased my Mom the baby Titan accordion instead of a piano. It came along with several instructional booklets, which we still own. It wasn't long after this that my Mom and Grandmother took a trip to a pawn shop and purchased a cream and gold coloured 150-bass Quagliardi accordion. 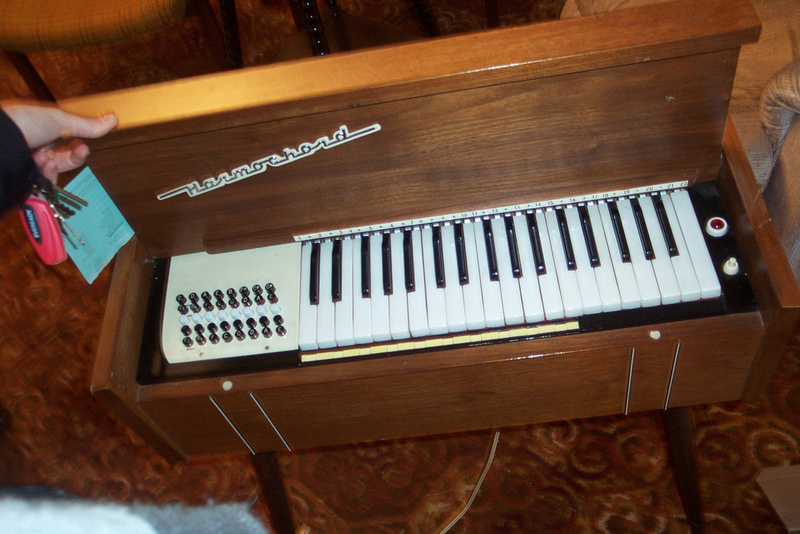 This was the first accordion that I learned on. 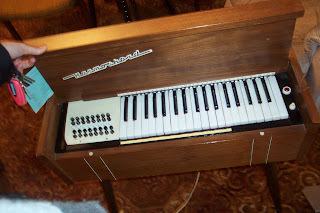 My Mother's family also had a Harmochord, which is pretty sweet if you ask me! It is much like an accordion, only electric and laid out in front of you. 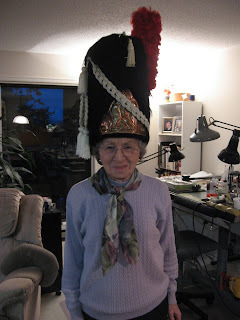 She is also a very good sport and wore this Beefeater hat for this picture! Thanks Grandma! I don't know the details of the story, but there was an accordionist on my Dad's side of the family, and this male relative played a diatonic squeeze box of sorts. 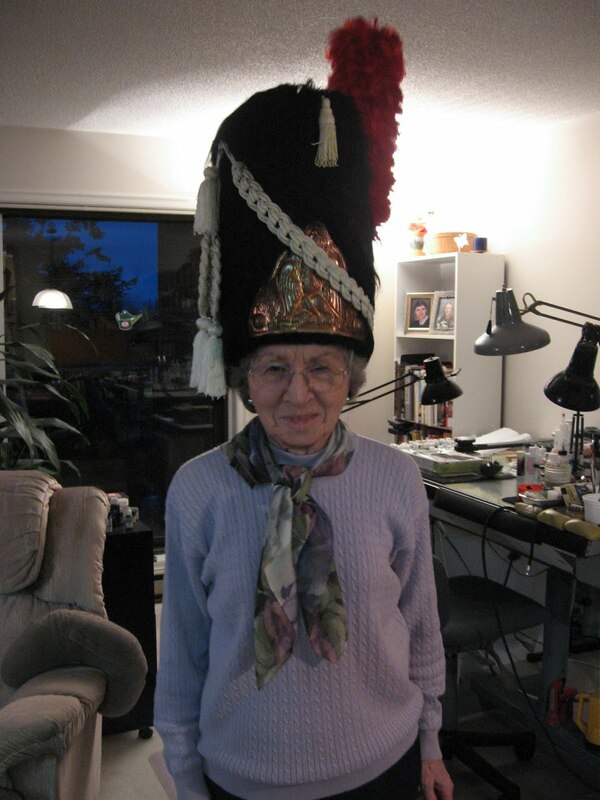 For those who know my Mommala you will know that she is very sweet and loves to laugh. She especially loves to laugh at GOD, the Scottish Drag Queen. Happy Mother's Day to my Mom and Grandma!